The technology works as an accelerant to the business organization. If a business is already efficient, technology will make it even more efficient. Conversely, if an organization is inefficient, the technology will eliminate all its inefficiencies via bringing out the best possible solutions. Progressive companies maximize their efficiencies via integrating the enterprise databases like CRM and ERP. In our previous blog titled CRM vs ERP, we already discussed the component features in details. It's known fact that CRM software functions with front-office information pertaining to customer interactions with sales, marketing, and support, conversely ERP software handle the critical back-office data. It also manages the customer information like purchase history, billing and shipping details, and accounting information once the order has been placed. Both ERP and CRM software solely offer substantial benefits to businesses. If ERP and CRM are integrated into a single software system, the business organization can seamlessly process their financial management, management Process, and marketing Process. 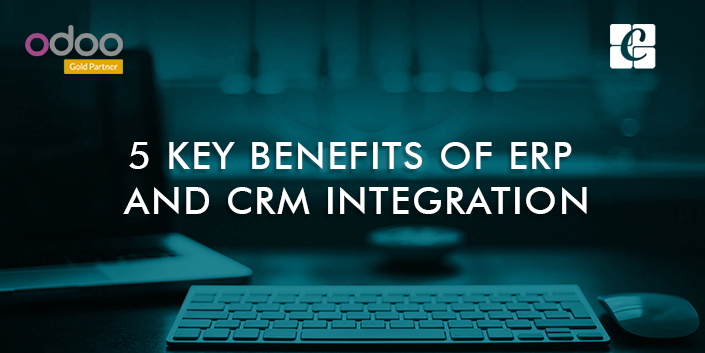 Let us look into the 5 key benefits of integrating CRM in an ERP system. 1. A 360-degree customer analysis. One of the prime advantages of integrating CRM in an ERP software is that it provides a detailed and complete overview of the potential customer. One can easily track customers buying habits, order history and also the general needs. From sales and support to finance and accounting, the integration makes everything seamless. With a better customer base insight it conversely builds lasting relationships, thereby determine the future potential growth. Consistent data gives better analytics and reporting, leaving customer preferences, profitability, and loyalty easy to track. Lack of timely information comes along with the risk of employees becoming less efficient and productive, resulting in a loss to customers. A fully integrated CRM and ERP software will provide the employee's access to real-time information without many complexities. In a single click, all the information pertaining to inventory levels, shipments, customer financials, order history, returns, payments, pricing are brought in. Both ERP and CRM software is embedded with contact and account information for different business purposes. While ERP focusses mainly on the billing and shipping addresses, CRM primly focuses on the prospects and sales/support. The ERP and CRM integration removes the tedious task of duplicating the data entry by bringing the identical rules for both CRM and ERP. For instance, if any kind of alterations made in the ERP, it will automatically reflect in the CRM and vice versa. The same principle applies to the addition/removal of custom fields, new entries or any kind of changes in the database. Integrating CRM with ERP initiates the businesses to turn their proposal generation into actual orders, which can be executed and tracked in an ERP system. It reduces the time consumed for the management of data, thereby improving the efficiency of the company. Furthermore, a sales team would have enhanced visibility regarding order status updates for customers and easy access to make necessary changes if needed. With a single, unified platform with functionalities of both ERP and CRM, one can easily bring down the IT costs. A single platform reduces the expense of maintaining two separate systems. With an efficient integration, one can also bring down the amount of support and training. Cybrosys Technologies, understand the client’s needs and processes, accordingly integrate the ERP befitting your business needs. For any feedback or queries, kindly drop your message to info@cybrosys.com.